Meh, I’ve been way too busy these days with school. Happily I should be mostly done with this year in a bit more than 40 hours among which 7 hours of examinations. Anyway, I was able to pack together a simple but nice shader editor. It currently only supports fragment programs, but it works well. It’s built around pygtkglext and python-opengl, and makes use of ctypes to bind all the fragment programs related functions. Supporting vertex programs shouldn’t be too hard, actually most of what’s needed for it is already in place, it just needs some GUIfication. All the required dependencies are in Gutsy’s Universe (pygtkglext wasn’t in Feisty’s). Should you find any bug, please report it to me by mail (you can find my address in the AUTHORS file). 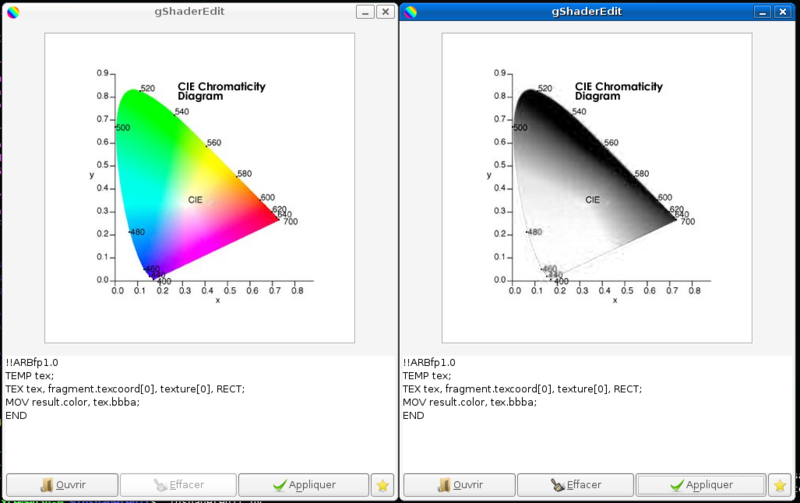 As part of Summer of Code 2007, I’m going to work on color filtering through Compiz/Beryl. The final goal of this project is to provide a flexible and efficient way to filter colors, switch through different filtering schemes or easily create custom filters. June 18 : fragment program shaders test application to check the effect of a filter on an area of the screen or a picture (there’s currently no such software, only QShaderEdit which doesn’t support shaders on textures). Please note that this roadmap is just a kind of draft, especially since I might be still quite busy with school until June 17th (*sigh*, there are three written tests remaining, one per Saturday). There isn’t much to see around here at the moment, check my homepage for more infos (yes, I know, you’ll get stuck into a loop until you get bored). Entries (RSS) and Comments (RSS). 16 queries. 0.124 seconds.